Double A’s growth reflected through their stand at the much awaited Industry event. Dubai, UAE, March 12, 2014 – Double A’s portfolio of premium quality ‘Made in Europe’ paper, from their Alizay Mill in France, was on exhibit at Middle East’s largest fair for paper and stationery, held at Dubai International Convention Center from March 4-6. This was in addition to Double A’s popular paper from their Thailand mills. 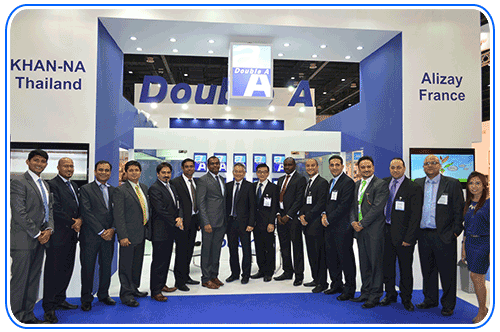 Double A also launched a new product range with the introduction of Double A Toners in the MENA region during Paperworld Middle East 2014. Double A also unveiled its special service centers in the form of Double A Copy Centres (DACC) in the UAE. These will be functional in Abu Dhabi and Al Ain followed by Dubai in 2014. The key products on display were Double A and Smart Copy 80 gsm papers and the Toners. Double A Toners will be available by April 2014 and expand the market scenario for the company in the related industries. These would be great value for money as they are priced competitively. “Our successful integration of the Alizay mill will provide MENA with high quality Double A paper. The shorter delivery time and better logistics will provide our customers with better operational efficiency to meet the growing demand of this region”, said Mr. Thirawit Leetavorn, Double A Senior Executive Vice President. Double A had over Two hundred fifty visitors at their stand. These key and enthusiastic customers and business associates were from all over Middle East, North Africa and South Asia. They had the opportunity to visit the booth and to speak with DDouble A Senior Executive Vice President and Double A representatives from the region to discuss about the latest trends in the paper industry, new brands building exercises and possible growth in business partnerships with Double A.